Bill Cobey, chairman of North Carolina’s State Board of Education, has heard all about K12 Inc.’s California settlement, a purported $168.5 million pact with the state’s attorney general amid long-running allegations that the for-profit virtual charter school operator inflated student test scores and attendance to drain more cash from public coffers. It’s of import to Cobey because K12, of course, is one of two companies operating similar, publicly-funded virtual charters in North Carolina, both of which experienced soaring dropout rates this year in their first eight months of operation while taking in more than $14 million in state funds this year. K12 denied the claims made against the corporation in California, pointing out the settlement included no admission of wrongdoing, but even without the news-making court deal, virtual charters represent a controversial model nationwide. Supporters say it’s an online-only model fit for students who struggle, for various reasons, in brick-and-mortar schools, be it because of health problems, scheduling conflicts or bullying. The dropout rate, about 30 percent of all students enrolled in the two North Carolina virtual schools this year, is staggeringly high when compared to traditional schools, but they’re perhaps not so astronomical when compared to other virtual charters nationwide. Still, while North Carolina has yet to publicly release any standardized testing scores on the schools’ first year, virtual charter programs have been besieged by complaints of lagging student performance in other states. A much-cited Stanford University study last fall found that some virtual charter students can trail their traditional school peers by up to an entire academic year. 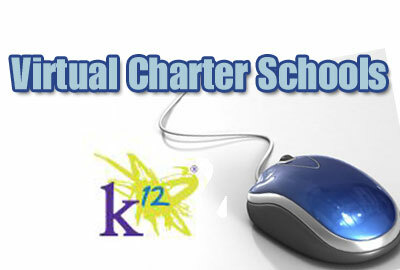 Perhaps it’s this environment, amid increasing skepticism of virtual charter claims, that led officials with the attorney general’s office in California to lash out at K12 Inc. last week while announcing the conclusion of a long-running investigation of the virtual charter outfit. The deal, according to Harris’ office, included $8.5 million in payments to the state and approximately $160 million in debt relief for the 14 nonprofit schools the company manages in California (Note: K-12 later disputed the state’s characterization of the deal). And it came as some in California called for state leaders to ban the for-profit, virtual outfits from the state. It’s a different environment in North Carolina, where after the first year of operation, Republican lawmakers leading the N.C. General Assembly moved to relax regulations this year, despite criticism that they were moving too soon to shed restrictions for the programs without any standardized testing data available. “There are far too many questions about their track record in other states, combined with how new these schools are to North Carolina, to already be proposing ways to make them less accountable,” Keith Poston, president and executive director of the nonpartisan, Raleigh-based Public School Forum of N.C., told Policy Watch this year. A national spokesman for Virginia-based K12 did not respond to requests for comment from Policy Watch, but Joel Medley—head of K12’s North Carolina school and the former head of the state office that oversaw charter schools—isn’t concerned with the news from the west coast. But to Cobey, whose board oversees the North Carolina virtual charters, the court deal in California should send a stiff warning. In 2014, state lawmakers directed members of the State Board of Education to approve two, four-year pilot schools in the state. Members of the board approved the only two that applied last February, K12 Inc.’s N.C. Virtual Academy and British multinational Pearson’s N.C. Connections Academy. The schools were cleared to open last fall with a maximum of 1,500 students each. But by most standards, it hasn’t been a seamless first year for North Carolina’s two pilot virtual charters. As we’ve reported at Policy Watch, the schools have experienced high dropout rates throughout the year. Through their eighth month of operations, nearly 30 percent of Virtual Academy’s enrollees had withdrawn, according to N.C. Department of Public Instruction (DPI) records, and more than 31 percent of Connections Academy’s students had dropped out. Both numbers would seem to clearly surpass the 25 percent threshold allowed in state law, yet members of the State Board of Education have not taken any action against the two schools this year. That’s because, as the two virtual charters point out, DPI’s reports do not include students who enroll in virtual charters for a “finite” period of time. State law this year allowed exceptions for such students, some of whom, for example, may be dealing with medical issues which prevent them from attending traditional school. Calculations including such students have not been publicly released, although DPI officials acknowledged this week that Connections Academy and Virtual Academy leaders did turn over those numbers to the state office in March. Policy Watch has requested copies of those records from DPI officials. Additionally, Medley did not respond to Policy Watch’s requests for the school’s records this week. Meanwhile, state officials are expected to compile and release student testing data from the virtual charters this summer, another key component for assessing the schools. In the meantime, Medley says critics should not be too quick to judge the schools. Leaders with Pearson’s Connections Academy could not be reached for comment on this story, but Medley said the two virtual charters shouldn’t be held accountable for the sometimes transient nature of their students. Virtual students often flow in and out of the programs, sometimes within the space of days, citing myriad reasons. “That is reflective of the model of education, not the quality of the program,” said Medley. Indeed, Medley said some parents have told him their children find the virtual program more challenging than traditional school coursework. Medley’s comments come weeks after North Carolina bundled into its completed budget—which was signed by Gov. Pat McCrory Thursday—a package of relaxed regulations for the programs. In addition to lowering the virtual charter residency requirement for teachers from 90 to 80 percent, those sweeteners also speed additional exceptions to the dropout count, including students who leave for “personal” reasons, move out of state or withdraw within the first 30 days after enrolling. Yevonne Brannon, chair of the advocacy group Public Schools First N.C., says state legislators should have waited until testing data was available for the schools before stripping any accountability measures from the law. Bruce Fuller, an education policy professor at the University of California, Berkeley, and an expert on California’s troubled virtual charter system, says accountability will be key as North Carolina proceeds with its virtual charter pilot. In California, Fuller said virtual charters like those run by K12 Inc. began with a “virtuous” premise—offering additional paths to graduation for students who, for various reasons, struggle in brick-and-mortar schools—but public perception of the programs soured due to bickering over public funds and performance. Fuller said avoiding the same scenario in North Carolina will require a “delicate balance” from state leaders. The charter school sector, in many states, has produced worthwhile education innovations and gains, Fuller points out, and virtual charters would seem to offer a cost-effective, alternative for struggling students. But such programs will require an attention to detail from states, he says. Based on reports from the State Board of Education, public school officials seemed to certainly be expecting a slower rollout with greater regulations. For example, before state lawmakers approved virtual charters in 2014, members of the State Board of Education prepared a report for legislators that recommended the state set a 25 percent withdrawal rate in the first year. By year three, the allowed withdrawal rate should be below 15 percent, that report said. However, legislators disregarded those recommendations when they wrote the law and, at one point during budget negotiations this year, GOP leaders favored a legal withdrawal rate as high as 35 percent before that provision was nixed. For his part, Cobey, a McCrory appointee, says it’s the General Assembly’s prerogative. Cobey declined to say whether he believes lawmakers should consider a lower dropout threshold, but he reaffirmed that his board is being watchful of the virtual charters. “The charter operators know that we expect them to run at a high level, and we will hold them accountable,” said Cobey. Cobey says he’s waiting for academic data to be released for the schools. And he cautions that he expects a fair assessment of the programs will take time. Brannon says she hopes that’s the case, but she’s skeptical that North Carolina’s system, complete with new, relaxed regulations, offers enough protections.